You'll be £20.00 closer to your next £10.00 credit when you purchase The Devil's Trap. What's this? The Indian Rebellion of 1857-58 was the most ferocious explosion of violence in the history of the British Empire. It tested Britain’s colonial resources to the limit, and nearly brought about the downfall of its rule in India. As the rebellion spread the strategic garrison at Cawnpore came under siege from rebels. The British inhabitants, including many non-combatant males and women and children, were caught up in the terrible events and spent nearly two months under profound threat which put them in fear for their lives and the likelihood of a brutal death; but they could not have imagined how dreadful that death would be. They suffered from thirst and starvation, and heat-stroke from the relentless scorching sun, holed up in a makeshift entrenchment, riddled with disease caused by the lack of sanitary provisions, and their numbers being seriously depleted from continuous bombardment by cannon balls and bullets from rebel snipers. 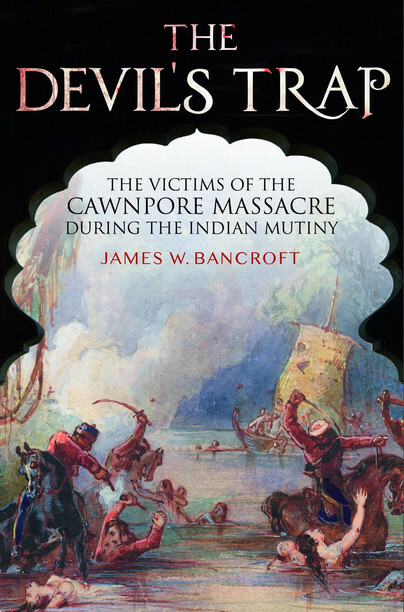 On being promised safe passage out of the city by boats, most of the men were treacherously massacred at the Sati Chaura Ghat, a landing-stage on the banks of the River Ganges, and the surviving women and children were imprisoned in a house known as the Bibighar to await their fate. That came on 15 July 1857, when they were slaughtered with cleavers in a murderous frenzy. On the following morning their naked remains were unceremoniously thrown down a well. At least six of them were still clinging on to life, including three children. Much has been written about the siege of Cawnpore and the political events which caused it, but there less known about the people who suffered the ordeal. Who were they, and where did they come from? James Bancroft is well-known for the depth of research he carries out, and during this project he has followed the lives of many of the victims. For instance, one had worked with the engineer Brunel; a member of a family of one of the victims later became a well-known cricketer and footballer, and another was a descendant of an Anglo-Norman West Country family. The author has tried to redress this by consulting official documentation and establishments, studying primary sources and contacting descendants, then cross-referencing and checking the information as much as possible. To try to understand opinions on both sides, he also studied documents and contacted individuals who believe the events at Cawnpore were India’s first steps in the freedom struggle towards eventual independence, and they have no misgivings concerning what happened.